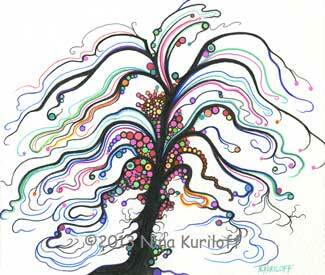 Here is my newest drawing of a tree that I completed today. It has been awhile since I painted or completed a drawing of a tree. I think of this tree as being a bit whimsical and playful. It measures approximately 6.5 x 7.5 inches. And, I created it using gel and micron and india ink pens on paper.